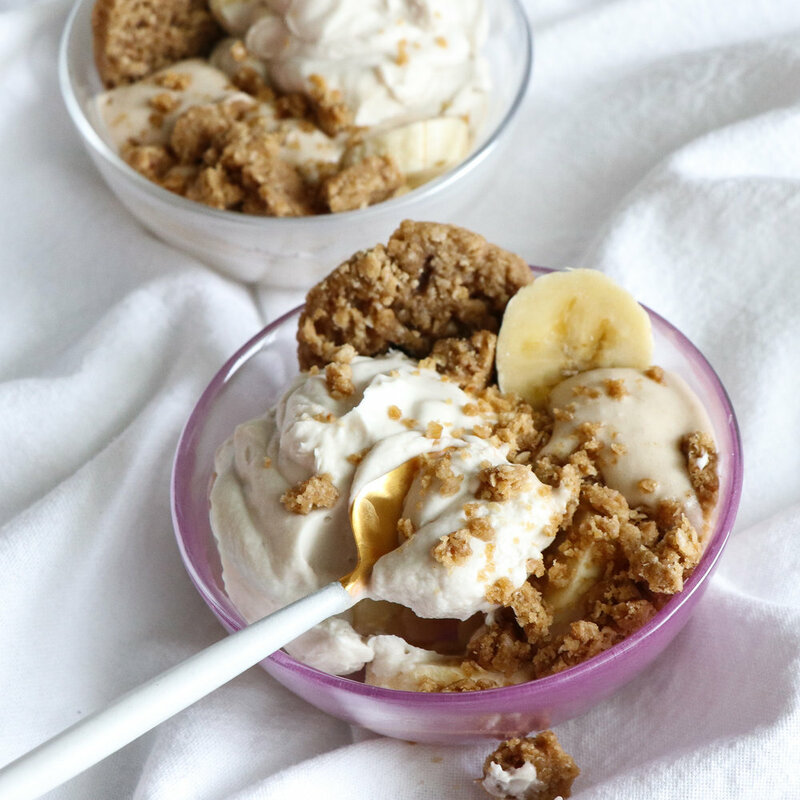 My recipe for banana cream pie is rich and creamy, dairy free, and egg free! Does any other dessert sound as tantalizing as banana cream pie? Before developing my own recipe, I had never tasted it, but out of nowhere recently I developed a massive craving that I couldn’t fluff off. Of course I knew that this type of pie was made almost entirely of dairy (butter in the pie crust, cream in the filling, whipped cream on top) but I knew I could use coconut cream to work around that. The next challenge was that I didn’t have time to make a crust, so allergy-free cookies fit the bill. In this case I used FreeYumm banana maple cookies but feel free to use your preferred top 8 free cookie. 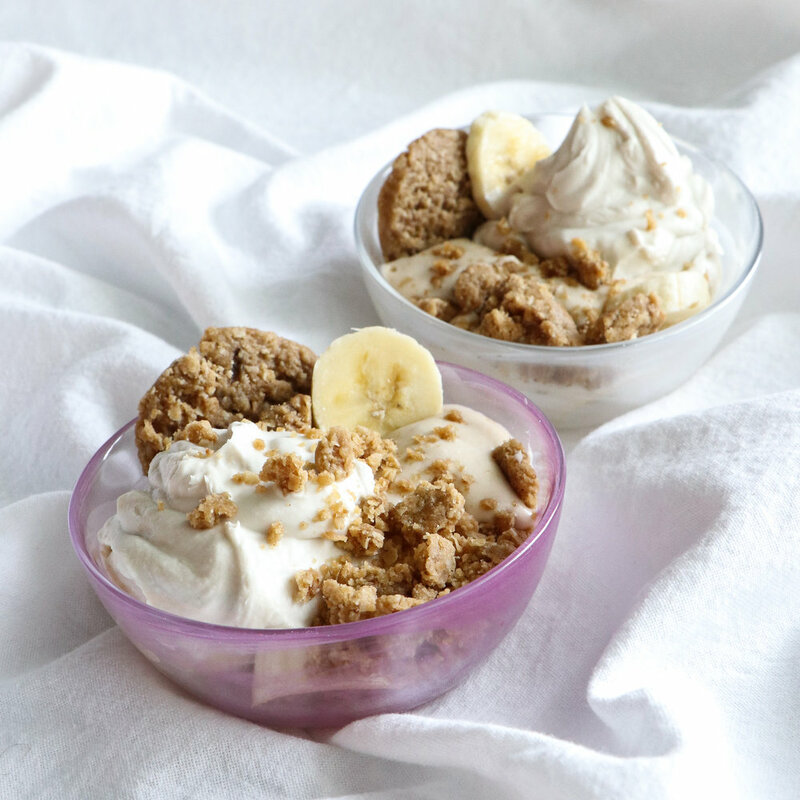 I really wanted the taste of banana to shine, so I was surprised when I saw that the banana cream in so many other recipes was full of egg yolk and heavy cream. I decided instead to use bananas as the cream. It’s amazing what freezing a banana can do for its texture. And finally, I did not want all the white sugar that the classic recipes call for, so I used maple syrup which adds natural sweetness and flavor. All around this dish was dynamite! My husband said it may have been one of the best desserts I’ve ever made. What a compliment! Pop a tin of full fat coconut milk in the fridge overnight so that it can firm up. The coconut cream is the thick fatty part. You can reserve the coconut water for another recipe. Prepare the banana cream. Slice a banana and freeze overnight. Take it out of the freezer and let sit for a half hour at room temperature, then blend with the rest of the banana cream ingredients. Set aside. Add all the coconut cream ingredients to a blender or food processor and blend until creamy and smooth. Set aside. Slice the remaining banana and divide the slices equally between two small dessert bowls. Scoop half of the banana cream into each bowl, on top of the slices. Place a dollop of coconut cream in each bowl, then stick a cookie in each one. Crumble the two remaining cookies over the desserts. Serve cold.